Coleus and Begonia. Impatiens grow better in shade than most other annuals. You can combine them with coleus with leaf colours that echo those from impatiens blossoms. Sow impatiens seeds indoors in moist seed starting mix, and provide very bright light. 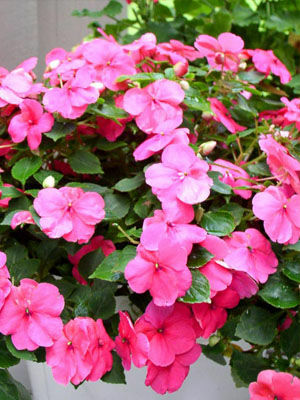 Most gardeners buy impatiens seedlings, which are widely available as bedding plants. Allow 30cm(12 inches) between taller varieties of New Guinea impatiens. Impatiens need a steady supply of water. Varieties are available in more than twenty different colours and bicolours. Spider mites can be a problem, especially with impatiens grown in containers. In recent years, impatiens downy mildew has become a serious problem following periods of cool rain.